Lets talk hair. Shall we? After my trip to Negril, I flat ironed my hair and proceeded to trim about 2 inches off of it. Which is why you see my hair is straight in the Memorial Day weekend photos. I just felt like my hair took a bit of abuse while on vacay, and just felt like my hair could use a little "refresher". While on vacay, I ended up wearing a lot of wash-n-gos which was even surprising to me. One, being that I'm not really a fan of wash-n-gos on myself because of the tangled hair, but also because I usually don't really like the way my hair looks, and two, as much as I love the beach and hanging out by the pool, I don't usually get my hair wet. I don't not get my hair wet for my hair's sake. I'm just not really the type to be in the water all swimming and ish--I tend to get in and just chill, wading with my drink in hand. haha So I figured I'd pretty much wear a braidout the whole time. Well, surprise surprise, I did end up swimming and ish, playing pool volleyball, etc. So I said eff it and wash-and-went the whole time. This caused me after I returned home to maybe rethink my wash-n-go stance. Maybe, just maybe, it is possible to get my wash-n-gos to look the way that I'd like....which is more defined. I feel like in the past, for the most part it starts out looking defined, but ends up in a frizzy mess by midday. Pics with the shades are the first day. Brown dress is second day hair. -Flaxseed Gel (Yep, I made some myself. Thought I'd see what all the hype was about. I think the hype may be warranted. Not totally sure though if my definition was mostly from the conditioner or this.) Tutorial on how to make your own found HERE. I co-washed my hair in the shower with a random cheapo conditioner, rinsed it out and then applied the TRESemme conditioner to my hair and pinned it up with a clip as I showered. Before I got out of the shower. I let down my hair and wrung my hair out REALLY well to get out excess water and conditioner. I DID NOT rinse the TRESemme out. I then clipped my hair back up so that I could rinse the conditioner I'd squeezed out off of my body and then got out of the shower. I immediately applied coconut oil throughout my hair and last applied my homemade flaxseed gel throughout my hair. Because my hair was still dripping wet, I pulled it back into one big twist, clipped it up and wrapped it in a towel for about 15 minutes. After removing the towel, I'd let it air dry to about 75% dry and then I diffused it the rest of the way. All I can tell you is that this is one of the most defined wash-n-gos that I've ever had. I don't even think the pictures are doing it that much justice. 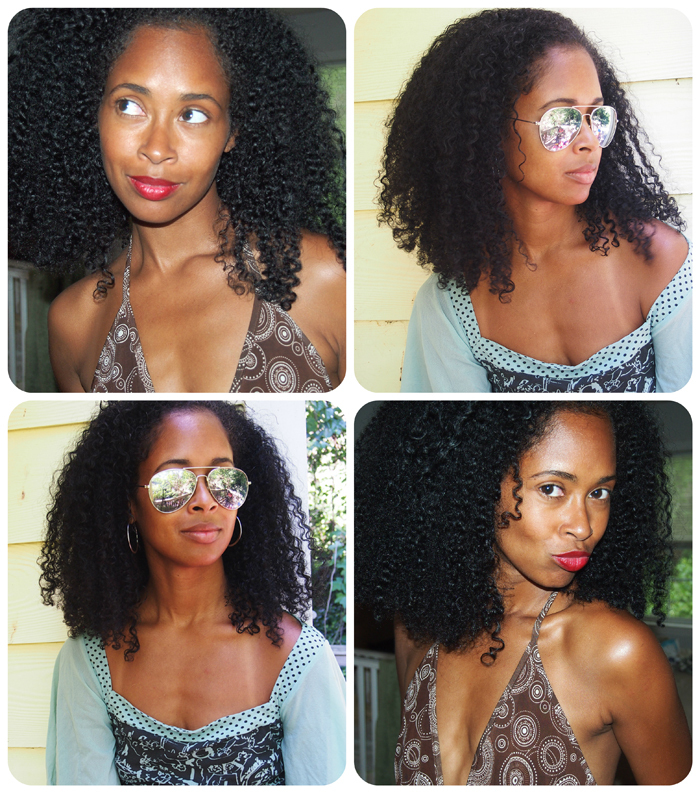 I know many naturals use regular conditioner as a styler, but I've always been somewhat reluctant to do it. I've tried it a few times, but not with results like this. I even pulled my hair up into a ponytail at one point and then let back down a while later and it fell right back into place--curls still defined! I ended up wearing the initial wash-n-go for 3 DAYS and it could have gone longer if I wore a puff. I'm sold! Absolutely beautiful! I haven't revisited wash and go since 2009 because of the tangles and wash day but i may have to since i didn't do this method back then! This looks fabulous! You should wear them more often! I've gotta try flax seed gel. I think I've tried every gel under the sun but that one. I never thought of trying the flaxseed gel because I didn't think it would have enough hold. Maybe I will try it after all! That wash and go is everything, ma'am! Love it... I'm going to have to try that on my daughter's hair. Looks gorgeous and the cut is all a dat! I love your wash 'n go looks. Glad to see some more experiments from you re: this. I'm betting it was the flaxseed gel that helped sustain it all day. Seems like I've seen lots of success with it lately from naturals. May have to give it a try! Very pretty Nik! I cannot even imagine sporting a wash N go for the same reasons but after seeing you and curly nikki rock it on vacation i may just let my hair go there on my next vacation!!! gal...I am still loving your hair, it makes a huge difference to your outfits. A nice outfit can be spoilt by bad hair, but your hair is gorgeous. Looks especially cool with shades too. Lovely! I "know you" from LHCF and Im always happy to see a hair post! Your hair is absolutely gorgeous!! Your hair looks fantastic. I just made my own batch of flaxeed gel. I'm hoping my hair comes out half as good as yours. I read and appreciate all comments & questions! Suscribe for Extra Content & Messages from NikG! Visit NikG Life + Style's profile on Pinterest. All images and content, unless otherwise stated are property of NikG Life & Style Blog. Please do not use any of my images without proper links back to my site. Copyright NikG Life & Style Blog 2010 - 2013. All rights reserved. Powered by Blogger.